Master storyteller Ralph Moody tells the thrilling story of a plucky horse who refused to quit, a down-on-his-luck jockey who didn’t let horrendous accidents keep him out of the saddle, and a taciturn trainer who brought out the best in both. During the Great Depression, Seabiscuit captured the hearts of Americans from the streets to the White House, winning more money than any horse at that time and shattering speed records across the country. In this real-life story Moody captures the hoof-pounding excitement of the explosive early races to an unforgettable showdown with the feared Triple Crown winner War Admiral. Moving and inspirational, Come on Seabiscuit! is a reminder of the qualities that make a real American champion. Ralph Moody is best known for his eight Little Britches books, which have delighted generations of readers and are all available in Bison Books editions. Ralph Moody captured the hearts of young readers everywhere with his beloved Little Britches saga. 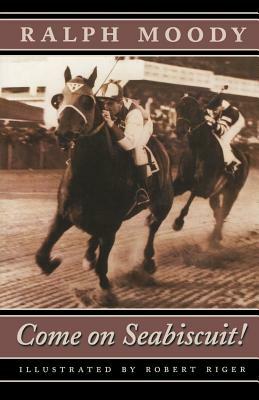 In this Bison Books edition of his 1963 classic, Moody brings to life the story of a knobby-kneed little colt called Seabiscuit, who against all odds became one of the most celebrated racehorses of all time. Although Seabiscuit was the grandson of the legendary Man O' War, he was neither handsome nor graceful. His head was too big, his legs too short, and his gallop was awkward. His owners gave up on Seabiscuit when he was two, raced him too heavily, and tried unsuccessfully to sell him. It took the keen eyes of trainer Tom Smith to recognize the heart, courage, and gallant determination of Seabiscuit, the qualities of a truly great horse. Smith's unfailing patience and astute treatments, the love and skill of jockey Red Pollard, and the continued support of owner Charles Howard forged Seabiscuit into a champion. Ralph Moody (1898–1982) was a working cowboy from the age of ten, a trick rodeo rider, and a student of good horseflesh. He is the author of Come on Seabiscuit! as well as the Little Britches series about a boy's life on a Colorado ranch, all available in Bison Books editions.